It was the right setting for a mathematical gathering: the bright Mediterranean sun overhead, the blue Aegean below, and the stark hills of the Greek countryside all around. All bright colors and sharp outlines. It seemed a clearer and better-defined world than that of our own daily lives, the kind we associate with mathematics itself. The fact that 2400 years ago mathematics had been shaped into the rigorous discipline we know today in similar settings and not far away, appeared to be no coincidence. What brought all of us to this charmed setting was a concern that mathematics, born of abstraction from the “real world,” had become ever more insulated from any world at all. Its highly refined accomplishments have taken it far from the experiences of most people, making its problems – not to mention the offered solutions – completely incomprehensible to all but a tiny cadre of specialists. To many, mathematicians have come to resemble an esoteric sect, whose members alone have access to secret otherworldly mysteries. All of us who came to Mykonos believed that this is an unfortunate situation. Mathematics is an inseparable part of human culture, and should be viewed and treated as such. Our underlying assumption was that mathematical reasoning had something important in common with that quintessential human activity – story-telling. But what this means, and what kind of connections can be drawn between the two, remained to be sorted out. With mathematicians, writers, philosophers, computer scientists, statisticians, historians, cognitive theorists, and artists in attendance, we knew that reaching common grounds would not be an easy task. An interdisciplinary gathering is different from the regular run of academic conferences. In ordinary meetings specialists seek out fellow specialists in their own field, in order to further refine their knowledge and expertise. Mathematicians talk to mathematicians, historians to historians, etc., with specialists in different sub-fields often congregating together into tight-knit groups. The dynamics of such meetings is towards ever growing specialization and refinement. A meeting like ours was meant to do the opposite. Each of the participants brought his or her own specialized concerns and his or her own traditions and practices with them. Each, in their presentations, relied on this background and drew on it to present their perspective on the interconnections of mathematics and narrative. But the purpose of the presentations was not to talk to other specialists, but to reach out to those outside one’s field, who come from other traditions but share a concern for the cultural place of mathematics. The movement was away from refined specialization, and towards identifying common grounds and shared concerns. What did we hope to achieve by this? Certainly we did not expect to come up with a grand “Theory” of mathematics and narrative. But we did hope to create a place for further discussion – an intellectual space where practitioners from different fields can come together, identify common grounds, and – quite possibly – take preliminary steps towards creating a new field of study. Did we succeed? Obviously, after such a long and diverse conference, it’s not easy to give a simple yes or no answer. But my personal feeling is that we did. The talks were very different from each other, and emphasized different aspects of the mathematics and narrative interrelationship. This was as we had expected. But they were also aimed at a broad and diverse audience. This is as we had hoped. The ones making the greatest effort to appeal to a broad audience were undoubtedly the professional mathematicians. The topics and format of their presentations were a long way away from what they are used to in mathematics meetings. Without exception they made the effort. In their different ways they succeeded in conveying to non-mathematicians the experience of being engaged in a mathematical problem, and the ways in which conceptualizing and resolving it is analogous to immersion in a story. The historians had perhaps a shorter way to travel in the style of their presentation, since the substance (though not always the reasoning, or the point) of their arguments is more easily accessible to lay people. They each showed how narratives – of travel, of progress, of tragic death, or even of history itself – played a crucial role in the definition of mathematical problems and the strategies devised to address them. The total effect of the historians’ presentations, however, went beyond the sum of its separate parts. If mathematics is indeed closely allied with stories, then one would expect different mathematical practices to go hand in hand with different stories. Whether this is indeed the case can only be studied historically, by demonstrating that in different times and settings, different types of mathematics are allied with different story lines. At the meeting, the historians used several episodes in 18th and 19th century mathematics to show precisely that. In doing so they provided indispensable evidence for the underlying thesis of the meeting itself. Whereas historians characteristically approached the question phenomenologically – providing the evidence without committing themselves on cause and effect – others tried to look for the actual underlying connections between mathematics and narrative. The results were some of the most ambitious presentations of the meeting: drawing on cognitive science, evolutionary theory, anthropology, and semiotics, they sought to establish the fundamental interconnectedness of these two modes of knowing. 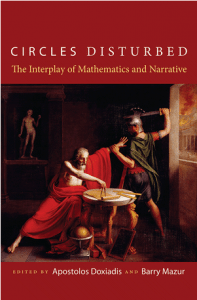 It is here that one would look for a possible emergent theory of mathematics and narrative. But the richness and diversity of the presentations does not fit neatly into these categories (“mathematicians,” “historians,”). There were philosophers looking to place the study of mathematics and narrative within a larger philosophical tradition, and artists talking about the challenges of presenting mathematics in visual and performing arts. And of course there were writers for whom the relationship of mathematics and narrative is not an abstract question but an immediate practical concern. So yes, I think we did succeed. Because almost without exception, the participants dared to step beyond their specific professional affiliations and into the common space – uncharted but undoubtedly present – of mathematics and narrative. Historian of Mathematics Amir Alexander was one of the first organizers of the Mykonos meeting, where he spoke of “Tragic Mathematics.” He is a member of the Advisory Board of Thales and Friends. © Copyright 2001-2005 Thales + Friends.